Be careful, this product is designed for French speaking children. For English speakers click here. Want to create a treasure for your daughter with her most beautiful childhood souvenirs? Give her the Capucine bébéothèque (baby chest), a pretty wooden trunk and its clever matching accessories, a birth gift that lasts a lifetime! Want to create magical moments with your child by preparing the most beautiful surprise? Offer to baby the Céleste bébéothèque (baby chest), a beautiful wooden chest with boxes and pouches to store all precious souvenirs. In search of a decorative and original gift idea to offer for a birth or a baby shower? Choose the Côme bébéothèque (baby chest), a trunk for childhood souvenirs that will find its place in the baby’s room as in the living room. With the Robin bébéothèque (baby chest), offer a magnificent wooden trunk inspired by nature to gather his most precious childhood memories. Hospital bracelet, first bootees, first dummy, birthday candle, pair of glasses: put each of these little treasures in a nice organza bag, choose the corresponding sticker and keep it intact in baby’s beautiful souvenir box.. This beautiful box will allow your child to keep his particular memories of his school years, his growth and the Little fairy. It contains a wooden height chart to note its growth, an album for his class photos and a lot of clever tooth boxes, all delivered in a nice cardboard box. To never forget the magical moments that you will live with baby, take this little notebook in your bag to note everything! - his first time and his discoveries. Be careful, this product is designed for French-speaking children (all stikers are in French). Because each child has a unique story and each family is different, Le Petit Pousse has created an original photo album: pages decorated with soft colours and stickers to use freely to talk about baby’s first months. An ideal size to be stored on a shelf or in a bébéothèque. To note and keep the souvenir of baby’s growth, Le Petit Pousse has created this beautiful height chart: light wood, writable and foldable. Mind the height chart graduation: available in centimetres only. Offer this unique birth kit to your little girl to keep all her souvenirs of her first year : the bébéothèque, the souvenir box, the baby photo album and the Baby diary. A birth or baptism gift that will last a lifetime! Offer this unique birth kit to baby to keep all the souvenirs of their first year : the bébéothèque, the souvenir box, the baby photo album and the Baby diary. Looking for a gift that makes sense for a baby girl? 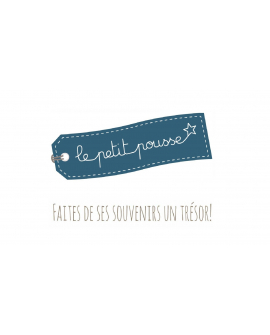 Offer this unique birth kit to keep all baby's souvenirs : the bébéothèque, the souvenir box, the baby photo album and the Baby diary. A birth gift that will last for a lifetime ! A wonderful birth or birthday gift that baby will keep for a lifetime !